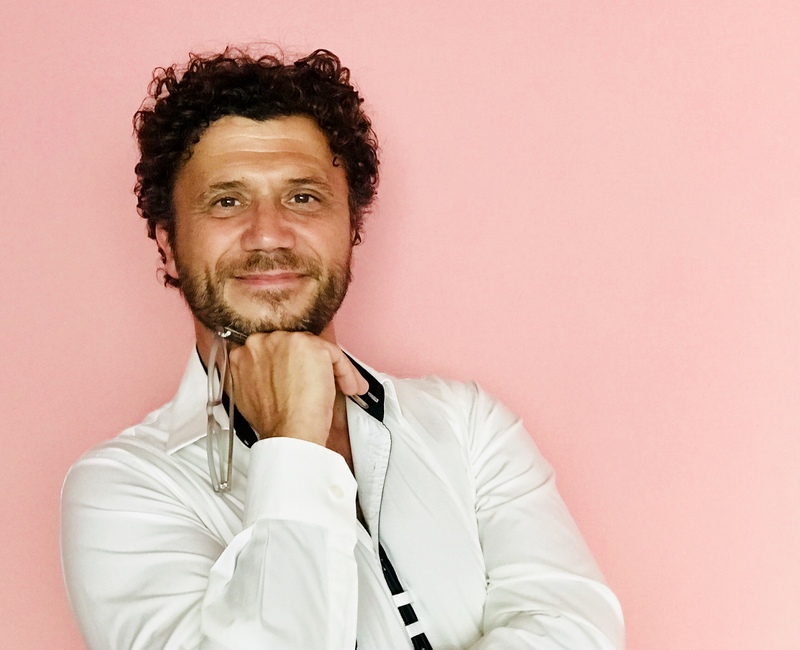 We spoke to Sylvain Lonchay, founder of Ahim’SA – an organization that offers yoga beach therapy as a tool against violence of the body and the mind. 1) Could you tell me a little bit about yourself? How did you get into the NGO world? ” I founded the Inspire Centre to promote Mindfulness and wellbeing at work. Contributing to leadership programmes for Right Management. At an executive level, I developed tools to implement the optimization of free time with the « pausing » concept, to gain energy, a clear mind and to help leaders find the right response in demanding situations. With my help, PricewaterhouseCoopers Switzerland and private banks in Geneva found a new way to coach and to empower individuals working under high pressure. Together with the ICRC in Geneva, the head office of the International Committee of the Red Cross, we incorporated Mindfulness training in the organization for the L&D and now the HR department. After years in corporate jobs in the Entertainment field and the Event industry (Torino and Beijing Olympic games), I then decided to find ways of changing work conditions and to help people suffering from Burn Out. I now teach people how to gain self-mastery as a way to change their life perspective. This is an expertise I love to share with passion. I integrate neurobiology research into my programs, doubled with simplicity I apply when practicing. My approach is based on the experience of an inner journey, softly. I learned Hatha Yoga in India following the teachings of Swami Satyananda from the Bihar School of Yoga (BSY). I studied Psychoanalysis logically oriented on C.Jung’s work, then became a Yoga Teacher and Yoga Therapist. I created a method for relaxation through concentration practices called Nidralogy, inspired from well known Yoga Nidra but in a more psycho-analytical angle – but I am no guru. Self Mastery doesn’t mean Religion; it’s a physical experience with inner comfort. I also regularly walk on the Camino, with business leaders, « The Way » to Santiago de Compostella (Northern Spain). A way to walk my talk – it’s about being in action, not in reaction. When I opened a yoga studio (100%YOGA) in 2010 in Lausanne, Switzerland, I remembered the essential for a Yoga Teacher is to respect the tradition and tradition says, as explained in the key book about yoga: Baghavad Gita, practice yoga for the others without expecting anything in return. That is called Karma Yoga. This is how the challenge started and so I created Swiss Yogathon, NGO based in Geneva, creating fundraising yoga events in Switzerland to develop aid programmes, without expecting anything in return! In India, we financed the construction of a well for 3 villages to have clean water and supported small schools in remote villages. I also contributed to a sanitary campaign with volunteering doctors to help people living of agriculture in remote places. 2) Having different organizations in different continents, what would you say the main culture-specific challenges are ? And what are the best ways to deal with them? 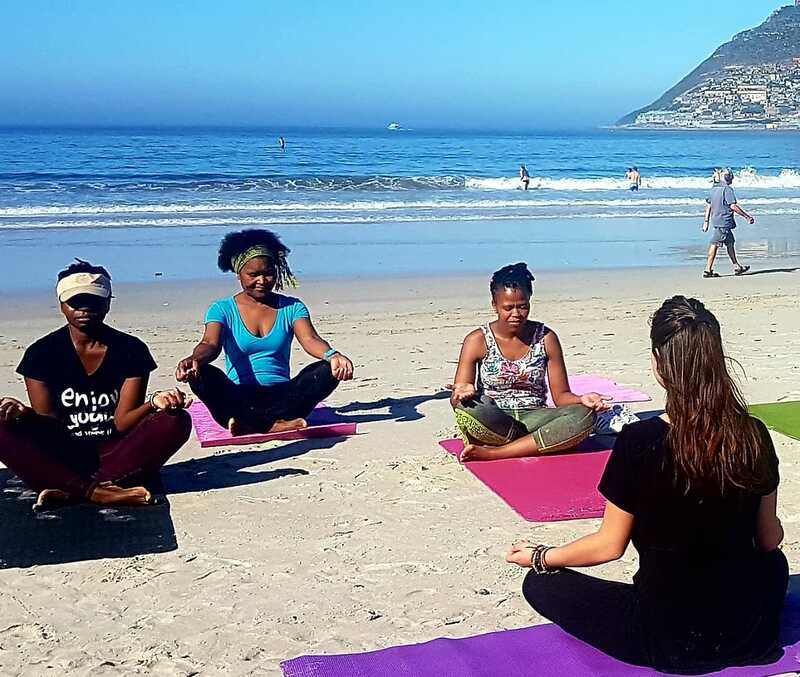 Another example is Yoga On The Beach in Hout Bay every Saturday morning. It doesn’t matter if you live in the richest part of Hout Bay or in the township – join the group, practice, share yoga. When we are in Downward Facing Dog yoga posture, we ALL look at the world from the same perspective!!! Important is the intention. The intention is silent, secret but in the end, if you have the right intention, then the right action brings the right results. While practicing yoga, on the beach or at home, we nourish values based on non-violence, self-empowerment, self-realization. On top of that, we benefit from the numerous advantages of yoga that bring good health, be it mental or physical health. To recap- be creative, dare to organize, invite people to share and in a few weeks, you end up with thousands of blue thumbs (“likes”) and many people who did not dare to initiate but wanted to be part of. Try and if it doesn’t work, let the universe readjust. Then it will come right sooner or later, but do it, and do it with the right intention. Inaction will lead to nowhere. 3) In terms of yoga – what types of yoga do you see as most effective for children, based on their age? A kind that is more meditation focused, like Kundalini- or something more movement focused? 4) The name of our magazine – ‘Amanzi’ means water in Zulu. We believe life is water and water is life. Not only water is essential to living, but water can be adopted as a life philosophy, based around living uninterrupted and in peace. Ahim’SA means is the Sanskrit word for ‘non-violence’. In that way, our company’s ethea seem to align. 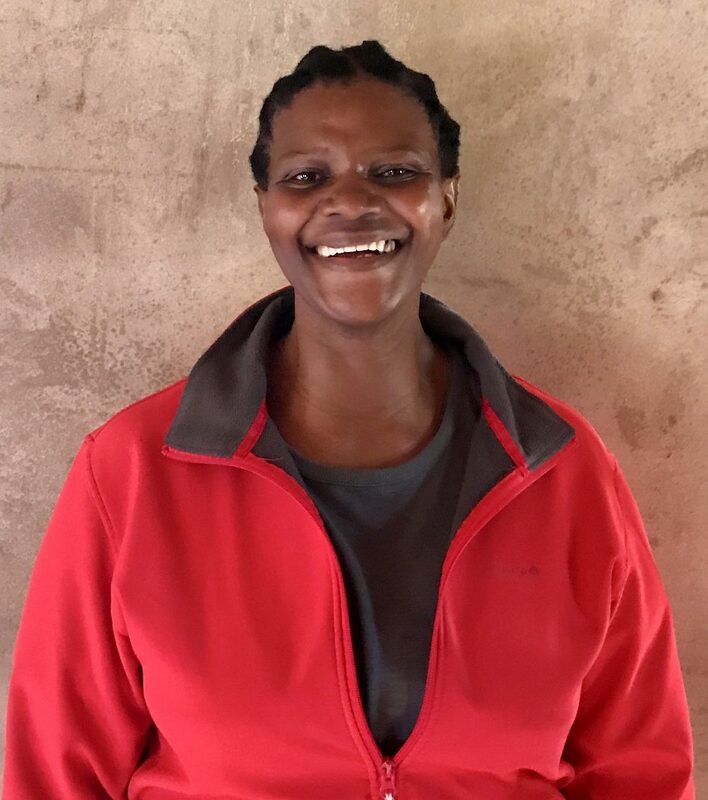 Can you tell more about how you have seen violence affect these kids – and about the water scarcity in the community of Imizamo Yethu? Our yoga philosophy is based on the Samkhya philosophy (one of the six ancient philosophies of India). Our lives are based on elements – Fire, Earth, Air, Ether, and Water, of course. It is a clear and logical perception of life: we need all of those elements to be One and to experience Oneness. It doesn’t matter where you live, what you do, what you wear or not…. you need those fundamentals. Water is within us since the day of conception, around us as well, in us for 70% of the human body, it is a protection in the mum’s belly, it is a means of surviving, it is essential. The first signs of violence are perceived by a human being when one’s needs are not fulfilled – water is one of our first needs. No need to understand more about Maslow’s pyramid – we need protection and security and water is our security. As much as we need light, we need water. We build our personality based on our relationship with those basic needs and we know that if we don’t have water for a few days, we will die. That’s the first violent reality and kids don’t know it. Just like elderly people in case of a heat wave, they tend to forget to drink. But this needs unconsciously hits when it is not fulfilled. The reason why Ahim’SA is getting stronger is also because we go back to the roots and explain what are our basic needs – security, protection, physiological needs, and love. Then we think of other needs but phones, internet and all materialistic components of today are not on the top of the list and we also would like to explain this illusion to other kids. To make it short, the illusion is what marketing make people think what they should have or what they should be. People go crazy for the American sweet soda drink or Lady Gaga’s music but this is an illusion because, at the end of the day, nothing replaces your basic water, a bit of food and some Light. In a township, the majority of people is looking for food first, then water. So yoga doesn’t give them food and water but a way to push away illusions of this marketing universe and feel real needs, in comfort and inner peace. But when you are thirsty and hungry, it’s easy to become violent. If we don’t have water (no rain, or no water in tanks, taps…) we feel danger is coming, silently but then it hits. If you don’t have enough water, your body is also shouting… headaches are the first symptom in case of dehydration. You see, many reasons to feel violence are related to the need for water. This is certainly even more obvious in Townships where people do not always have tap water and sometimes have to fight for a bit of it. 5) In terms of water sustainability, what is your advice? How can an individual make a difference – do you have some advice for us, or know of organizations we should look to support? “Our recommendation is the same for the entire environment sustainability, not only for water: let’s be creative and let’s not wait for governments and institutions to change things. That’s what NGOs do. We can find solutions; we must find solutions and educate kids to preserve water and nature. There are projects that do not depend on fossil energies and that allow the collection of fresh water in the desert by collecting mist in the air, like Warka Towers. This is an example of creativity while respecting our goal – which is to be creative and strengthen our lives by living together and not against each other. We are an organization that protects Nature and human nature. Yoga is about enhancing every sign of life, respecting living creatures and nature for its best. But to do this, we must face the worst. We strongly believe that education will make a difference and once we have our Ahim’SA House, we will schedule training for kids to be aware of the consequences of misbehaviors with Nature. However, we will do the same type of training for parents, as we don’t fully expect children to educate their parents, even if we hope children will lead by example. Did you know that beach lifeguards are now like doctors and police – they’re not allowed to strike? Lifeguarding is a Profession and an Essential Public Service, removing the right of employees to strike as this could lead to the loss of lives, lifesaving experts say. Amanzi Magazine - Your South African Water Sports & Culture Portal Amanzi Magazine - Your South African Water Sports & Culture Portal shared a post. Durban, Tuesday, 2nd April 2019 - The race is on for Mzansi’s aquatic stars as the 2019 SA National Swimming Championships heads for the coastal city of Durban, with the action taking place at the Kings Park Aquatics Centre from 8th to 12th April. Feel good story : We are so delighted to report that the NSRI , SAWDN and the efforts of a collective of volunteers has finally paid off. A whale that had been entangled to have come across a whale entangled in fishing rope, fishing gear and floatation buoys, 1.5 nautical miles off-shore of the Sea Point Pavilion has been rescued!